Funeral Home Web Site Online Obituaries. Most online obituary services actually drive visitors away from the funeral home's web site, where MemorialSoft websites keep visitors on the website and brings them back. 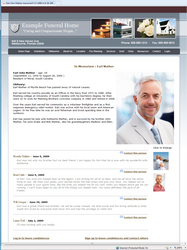 For more information visit http://www.MemorialSoft.com and test the software on actual client’s funeral home websites. Obituary Software PNGMemorialSoft Funeral Home Web Sites with Guestbook Obituaries. Sample Obituary in TIFF FormatThis is a sample screen shot of an obituary in TIFF format.